Palak dali ambat recipe - Spinach dal curry is one of the varieties of coconut based gravies that is usually prepared in South Indian homes. Curry is called as ambat in Konkani language. This is a very easy to cook curry and it is usually served with hot rice. In konkan region, coconut is used to prepare gravies (ambat) and palya. Rice and curry is my comfort food which I like to have it for both lunch and dinner. So, besides spinach dal curry, I often prepare methi dal ambat, basale soppina palya, dal curry with white masala, tomato saaru, drumstick dal curry etc. Fry the coriander seeds, cumin seeds, mustard seeds and fenugreek seeds separately in little oil on low heat and set aside. Fry the dry red chillies in little oil and set aside. Combine together the coconut, fried ingredients, garlic cloves, turmeric powder and put them in a mixer jar. Grind it using a cup of water to make a smooth paste and set aside. Clean the spinach and remove the stems. Wash the spinach thoroughly and chop. 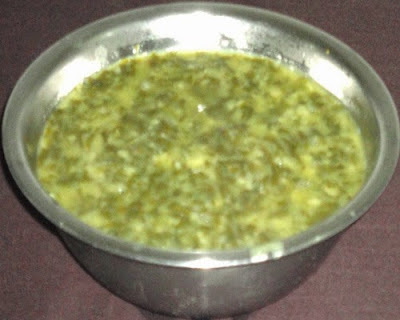 Wash the toor dal and combine with chopped spinach. Add 1 and 1/2 cups of water to it. Pressure cook till 3 - 4 whistle. When the pressure releases, transfer the dal and spinach mixture to a broad pan. Add the ground masala. Add salt. Add little water if required. Mix with a spoon. Serve hot with rice. 1. Fry the coriander seeds, cumin seeds, mustard seeds and fenugreek seeds separately in little oil on low heat and set aside. Fry the dry red chillies in little oil and set aside. Combine together the coconut, fried ingredients, garlic cloves, turmeric powder and put them in a mixer jar. 2. Grind it using a cup of water to make a smooth paste and set aside. 3. Clean the spinach and remove the stems. Wash the spinach thoroughly and chop. 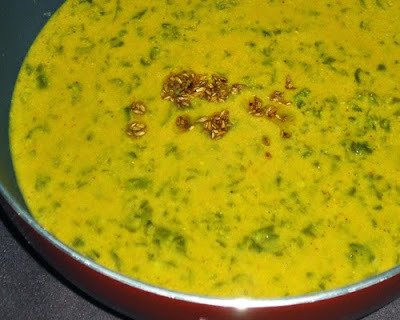 Wash the toor dal and combine with chopped spinach. Add 1 and 1/2 cups of water to it. Pressure cook till 3 - 4 whistle. 4. 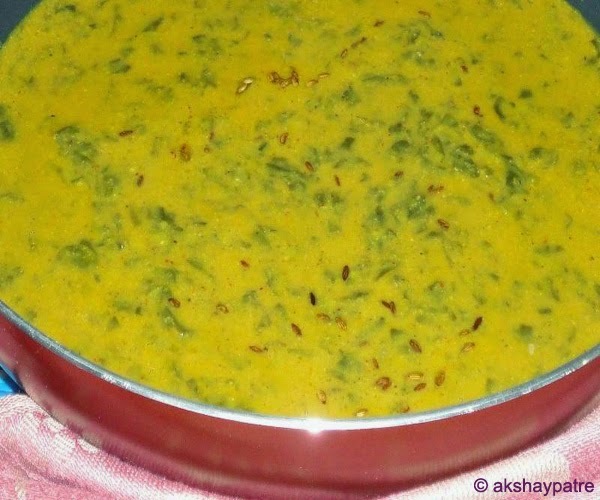 When the pressure releases, transfer the dal and spinach mixture to a broad pan. 5. Add the ground masala. Add salt. Add little water if required. 6. Bring the curry to boil and simmer for 2 - 3 minutes. Heat oil in a small pan, add cumin seeds and asafoetida, saute till aromatic. Pour this tempering over the boiling curry. 7. Mix with a spoon. Serve hot with rice. super delicious spinach dal curry. The dal looks delicious.. and healthy too.. It looks and sounds so delicious.